So the Pune Municipal Corporation [PMC] and Pimpri-Chinchwad Municipal Corporation [PCMC] have finally managed to get part of their Pet Project; the Rainbow BRTS partially operational. The Aundh-Ravet section of the BRTS is partially open. BRTS buses make an announcement while crossing Aundh Gaon that from the upcoming stations, the BRTS doors will open instead of the regular ones. Like a standard BRTS project, this project has bus lanes. However, unlike the Katraj-Swargate-Hadapsar line, it is not just bus lanes in the centre of the road with regular bus stops and boarding. Similar to the Ahmedabad Janmarg, it makes use of level centre-boarding, i.e, it uses the doors on the right hand side, which are at the same height as the platforms. The entire system is operated by the PMPML. Jagtap Dairy Rainbow BRTS Station. Image Copyright Srikanth Ramakrishnan, CC-BY-SA 4.0 International. Image available on the Wikimedia Commons. Aundh – Ravet: This starts at Sangvi Phata and ends at Mukai Chowk in Kiwale, right next to the starting of the Expressway. Nigdi – Dapodi: This starts at the Bhakti-Shakti terminal and goes upto Dapodi, along the Old Mumbai Pune Highway. Wakad – Nasik Phata: This starts at Hinjewadi Phata, proceeds to Jagtap Dairy, Kokane Chowk, and then crosses the Nigdi – Dapodi Line at Kasarwadi where it terminates. Kalewadi Phata- Dehu Alandi Road: This starts from the Aundh Ravet corridor and goes over the Pavana, crosses the tracks and Old Highway at Empire Estate and then goes further. Currently, the Aundh to Ravet line is operational. As part of this line, two split flyovers, one at Kalewadi Phata and one at Dange Chowk were built, along with a grade separator being built at Sangvi Phata. The BRTS stations, are quite similar to the Ahmedabad Janmarg. Some stations like Kalewadi Phata, and Jagtap Dairy have only one entry/exit, on the side towards to the signal, while some, such as Dange Chowk have exits on both sides. Due to paucity of space, the road goes from 6 to 4 lanes north of Tathwade Chowk station, and stations are split. There are two stations, one for each direction till Kiwale. The Ravet Chowk station is a bit precarious, because of the presence of a speed-breaker at both ends plus its location is at a curve. The Kiwale terminal, is a grand structure, located just off the starting of the Mumbai-Pune Expressway. One side of it is for BRTS buses, while the other side is for Feeder buses towards Nigdi, Dehu Road, et al. Mukai Chowk, Kiwale Terminal BRTS Station. Image copyright, Srikanth Ramakrishnan, CC-BY-SA 4.0 International. Image available on the Wikimedia Commons. The routes running along the BRTS are your regular routes that otherwise use the Aundh Ravet Road, such as 115P, 204, 276, 298, Vajra 5, etc. Vajra 5 goes all the way up to the Mukai Chowk Terminal at Kiwale, while others turn off at Kalewadi Phata and Dange Chowk towards Pimpri, Chinchwad, Nigdi and Hinjewadi. The announcement system announces the name of the station, as well as stops along the non BRTS section. At Sangvi Phata and Mukai Chowk, it is also announced that the BRTS ends. After Sangvi Phata towards Aundh Gaon and after Aundh Gaon towards Sangvi Phata, an announcement is also made instructing passengers the other side doors will be used, Right side towards Chinchwad and Left side towards Aundh. The system so far seems well done, though I wish the announcements would say ”Next Rainbow Station” instead of BRT station. Drivers, however, still need to know exactly when to stop the bus. Both doors have a Red-Yellow strip with stop written on them to indicate to the driver where to stop the bus so that the door sensor is aligned. I’ve noticed drivers and conductors inching forward and backward to align it so that the sliding platform doors can open. 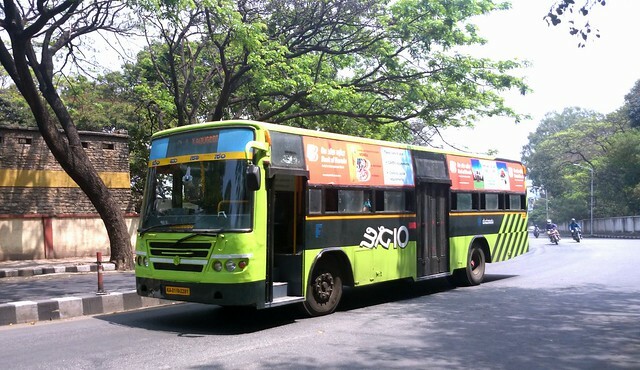 Apart from this, the doors on the left side are also being closed, something similar to Bangalore buses, though in some cases, the rear door is latched, so it doesn’t close even if the driver closes it. Red coloured Ashok Leyland buses. Pink and White Tata Marcopolo buses. Pink and White Ashok Leyland buses. Currently, only the first category of buses ply on the BRTS. Other buses are used on other routes, and if they are used on the Aundh-Thergaon route, they run outside the BRTS lanes, like regular buses. These buses are fitted with Hanover LED displays on the outside as well as inside. Some of them don’t have the system working so, they go with a board placed in the front. The system makes extensive use of GPS. There are displays in each Bus Station listing the arrival of the next four buses and their destinations. However, those buses whose systems aren’t working, are often not shown by the system, and thus you might see a 276 unexpectedly arriving, en route to Warje Malawadi. There are ticket counters at each station, which are presently not in use. Punched Tickets are still sold on the bus in the old fashioned way. The Kiwale Terminal also has provisions for shops. It has Washrooms for Passengers, along with Dustbins, which are present at several other stations as well. Overall, I think for a project that is still under construction, and still in trials, the Rainbow BRTS has done a decent job. However, this is the PCMC half of the project, I am yet to see what happens on the PMC section along Nagar Road and Vishrantwadi, where the latter has been operational for a month.